Scáthach, meaning “The Shadowy One” in Gaelic, was a mythical Celtic warrior and martial arts trainer. Her school of warriors turned out some of the top Celtic heroes. 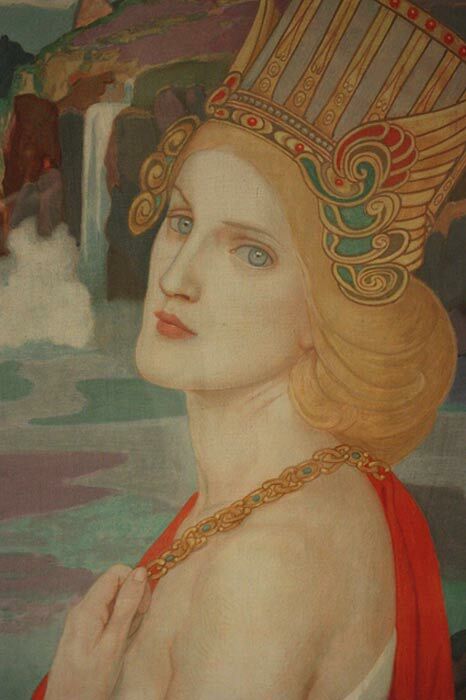 Her most famous student was Cú Chulainn , the most notorious warrior from Irish mythology and akin in many ways to the great Greek warrior Achilles. The intense tales of Cú Chulainn's life and battles were really only possible because of one very important person—one very important woman. A woman whose only purpose in Irish mythology is to teach the best and strongest of Ireland's warriors to harness their martial skills , but who is only recognized through the exploits of the men she trains. That woman is Scáthach of Alba. 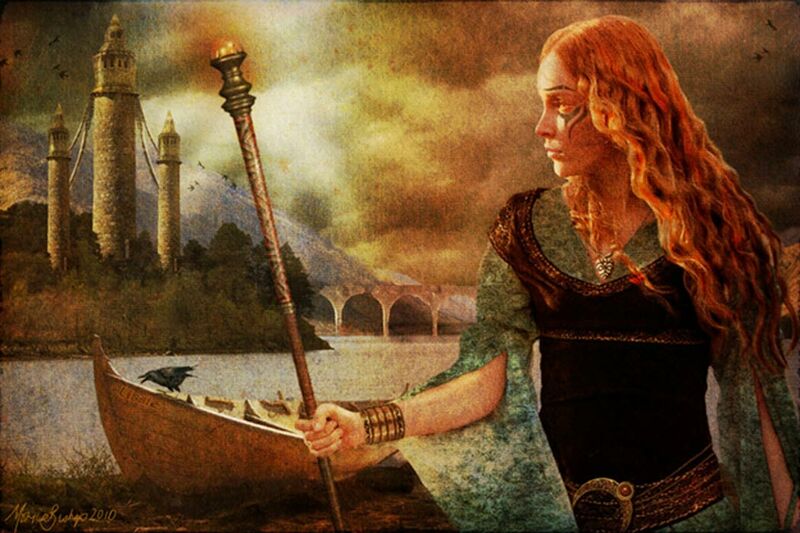 To tell the story of Scáthach (also written as Sgathaich), one must first tell the tale of the male warrior she created. And as all good mythological warriors, the combative talents of Cú Chulainn are forged by the love of a woman. In Tochmarc Emire , "The Wooing of Emer", Cú Chulainn must take a wife for the peace of mind of the fellow men of Ulster—men terrified that a man of Cú Chulainn's beauty will steal their wives and daughters. 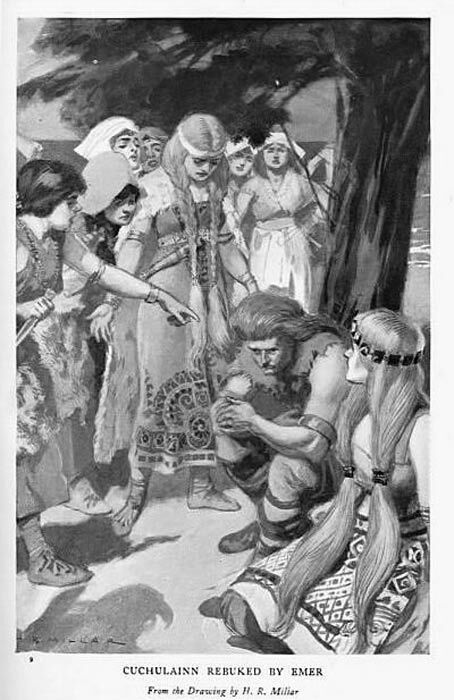 Emer, daughter of Forgall Monach, was the only woman who caught his eye, but the natural roadblock in such a scenario was her father—adamantly against his younger daughter marrying before her elder sister. He bargained with Cú Chulainn, demanding proof of dedication by suggesting he train under the warrior woman of Alba, Scáthach. Unbeknownst to Cú Chulainn, who agreed because he was so determined to wed Emer, Forgall Monach's truly hoped that the meeting with Scáthach would lead to the warrior’s death. Scáthach's part in the Ulster Cycle thus occured here, at the matrimonial junction of Cú Chulainn's life. At his behest she taught him the various arts of war in the land of Alba, her home which was believed to be located on the modern Isle of Skye . Even today, legends say the ruins of a castle in the Parish of Sleat, on the coast of the Isle of Skye was the home of this famed woman. Today it is called Dunscaith Castle (or with some variation to the spelling), Tokavaig, or the Fortress of Shadows. It was notoriously difficult to cross the sea to reach her dwelling. And entering Scáthach's fortress was a perilous task in itself. Along with numerous other trainees, such as Conchobor and Lóegaire, Scáthach dwelled in an impregnable castle guarded by her own daughter. She also had other children, daughters named Lasair, Ingean Bhuidhe, and Latiaran and two sons named Cet and Cuar. Those two sons were later saved by Cú Chulainn as a sign of loyalty to his former teacher. The fortress is where Scáthach trained warriors in underwater combat, pole vaulting (as it teaches men to scale tall structures) and how to battle with a weapon of her own creation: a barbed harpoon called gáe bolg. This weapon could allegedly penetrate shields and maim or kill even if it was thrown from a vast distance. Historically, Tochmarc Emire is considered an early edition of Táin Bó Cúailnge , also called "The Cattle Raid of Tooley" or "The Táin", an epic describing the war between the Queen of Connacht, Medb (Maeve), and Ulster, protected by the aforementioned Cú Chulainn. The overall value of Scáthach's training, which lasted for seven years, becomes evident in the epic as Cú Chulainn leads his men to victory in the war between Ulster and Connacht, though with many casualties. In later traditions, Cú Chulainn himself suffers a mortal injury on the field of battle and dies after the enemy forces have retreated—not unlike the tale of King Arthur's final battle. Although Scáthach does not play as much of an active role in Táin Bó Cúailnge or Tochmarc Emire , her impact in Irish myth lies with Cú Chulainn. Training under Scáthach did provide Cú Chulainn with the skill to win Emer, however it was not his determination that won her father over. Instead, Forgall once more refused the marriage despite Cú Chulainn's completion of his training. But it was that same training that enabled Scáthach’s student to storm Forgall's castle and steal Emer and Forgall's treasure. Furthermore, as arguably the most well-known character of Irish mythology—whether readers can pronounce his name correctly or not—Scáthach's time with Cú Chulainn led to his ultimate victory over Queen Medb . And Scáthach’s role transformed over time to include the realm of the dead. As a Celtic goddess of the dead , Scáthach was in charge of taking worthy warriors who were killed in battle to the Lands of Eternal Youth. This work likens the Celtic deity to a Norse Valkyrie. The legend also says that Cu Chulainn lay with Scathach and that they had a son. Cu Chulainn never knew his son had been born because Scathach never told him. When his son was 14 years old, he went to find his father. He came across a big fortress and challenged a warrior there. Because of his armour, no one noticed he was just a boy. 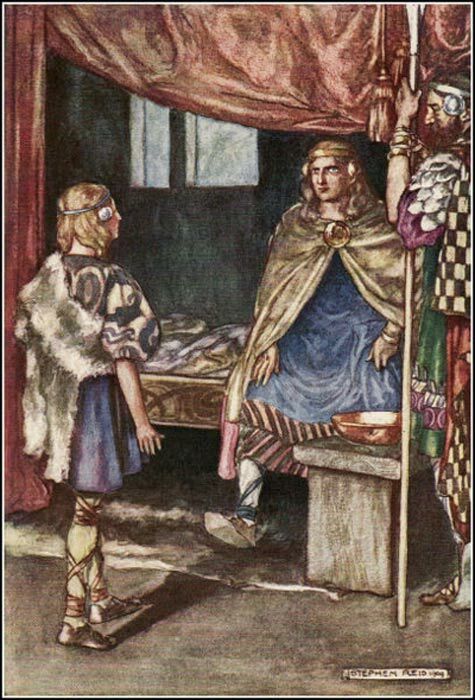 Cu Chulainn ended up killing his son and realising the boy was his son only after he died, as he had a ring he had previously given to Scathach. 1) it wasn't with scathach he had the child with it was her sister aoife 2) there was no fortress involved 3) his armour did not conceal the fact he was just a boy (in fact cu chulainn was only 7 years older than him). 4) Cú Chulainn's wife emer had told him it was his son before the fight but the reason he had to fight him was because connla (his son) would not tell him his name due to a Geis (taboo) that was placed on him. really dont know where you got your version from but its wrong. Dear Mr Broderick, anyone who has studied ancient texts, history and mythology knows that there are many versions and variations to each and every such story, depending on different texts, as well as the particular place and re-telling. Even much more ‘current’ history, like WW2, presents us with different versions, so it is obvious that such myths as Cu Chulainn’s not only present different ‘versions’ but actually different theories, since what we have is a myth here and not actual historical facts. And by the way, you asked about where I got ‘my version’, but I don’t see you citing where yours came from. This is simply a legend of Semiramis of Babel after Nimrod died. She was a prostitute, created goddess worship, UFO contactee, mother of some of the Nephilim giants, first witch, woman ruler. Dressed as a man she led her army against the Armenians. See my books for documentation.